Doha's climate justice: will China now pay the rest of the world? 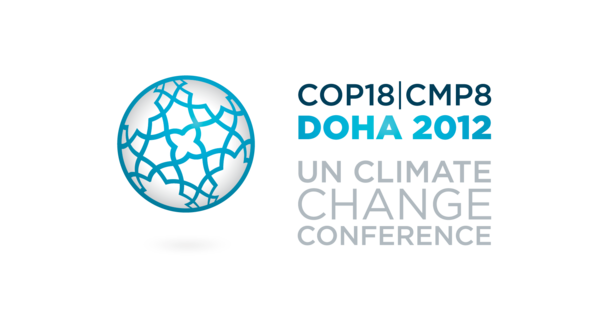 One result of Doha is to allow the dumbest countries on Earth to continue poisoning their economies by extending the pointless Kyoto Protocol (which no longer includes Japan, New Zealand, Russia and Canada, and has never included the US, or any developing countries) until 2020. Even the Kiwis are smart enough to have bailed out, but not Australia, with Greg Combet proudly shackling us to the stern of the Titanic as she sinks beneath the waves. More important than that is talk of “compensation” for “loss and damage” to developing countries caused by climate change. Unsurprisingly, developing countries want a blank cheque. Doing so would give life to the comments at the start of the summit from the chief of the UN climate body, Christiana Figueres, that “in the whole climate change process is the complete transformation of the economic structure of the world”. But once again, the muddled thinking would, if taken to its logical conclusion, result in unintended consequences. China and India are two of the worlds largest emitters – China is THE largest. So I guess compensation should flow from China and India to, say, Australia, for the costs that we will incur adapting to rising sea levels [allegedly] caused by those emissions? Why should funds flow from Australia to pay countries that emit many, many times more CO2 than Australia? No wait, they say. You evil developed countries started all this with the Industrial Revolution. Maybe, we say, but there was less than one degree of warming in 150 years. Look at the predictions now – 4 to 6 degrees in just 88 years! Your emissions, developing countries, are swamping everything we did since the 1850s. The likelihood, of course, is that the compensation won’t actually be for our emissions, but for the behaviour of the Sun, or natural multi-decadal climate cycles, or some other factor the IPCC has missed or ignored, over which we have no control whatsoever, essentially reducing all of this to little more than global wealth distribution. It’s that time of year again. The climate wonks all disappear on a carbon-fuelled jolly to a six-star hotel to work out how to save the planet, and the leftard media spew out acres of climate alarmism to help The Cause. No media organisation does this better than our very own ABC, a clone of the once-great-but-now-shite BBC. The latest snapshot from climate scientists has found the planet is on track for a 4 to 6 degree Celsius temperature rise by the turn of the century. As United Nations climate talks enter their final week in Doha on the Persian Gulf, scientists are increasing the pressure on governments to do more to cut the discharge of heat-trapping greenhouse gases. The Global Carbon Project report, published in the journal Nature Climate Change, has calculated that emissions rose by 3 per cent last year, and 2.6 per cent this year, despite the weak global economy. Pep Canadell from the CSIRO was one of the lead authors of the report, and says the growth in emissions is shocking. “Our analysis showed that by the end of this year, 2012, global emissions from fossil fuels are set to reach an unprecedented amount of 36 billion tonnes of carbon dioxide,” he told AM. He says on current trends, governments globally will have no chance of averting dangerous climate change. But despite emissions growing faster than ever, temperature rises have slowed to a crawl in the last decade or so. A six degree rise by 2100 would require a 0.7 degree rise every decade from now until the end of the century. What happens if we splice this on to the current temperature chart? 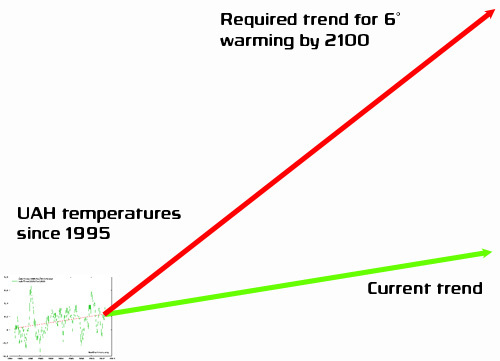 Not only that, but this graphic uses temperature trends since 1995, if you take the trend since 2001, it’s even less. You would have thought, if CO2 were the main driver of global temperatures, that accelerating emissions would result in accelerating rises in temperature, but in fact it is precisely the reverse. South Korea will host the COP18 talks in 2012. Of course, by that time, the science of global warming will have been exposed as corrupt and flawed, the general public will realise that the climate system cannot be controlled by the CO2 dial, and hopefully people will have moved on to spending money on actual problems, like alleviating poverty and disease, rather than chasing shadows. The South Korean President says his country will host global climate meetings in 2012, the last talks before obligations expire under the landmark Kyoto Protocol. Lee Myung-Bak told Copenhagen that the meeting, known in UN jargon as a Conference of Parties (COP), would take place in South Korea in three years time. “Korea is ready to contribute in opening up the post-2012 regime by hosting the COP 18 in 2012,” Mr Lee said. The Kyoto Protocol requires wealthy nations to cut carbon dioxide emissions, blamed for global warming, until the end of 2012. Nations are negotiating in Copenhagen on what action to take after 2012, but talks are bogged down by disputes with wealthy nations pushing for independent verification of developing state action against climate change. All I can say is that I hope they’re as successful as COP15.